Transformers Prime: Darkness Rising is a mini-series containing the first five episodes of the new Transformers: Prime CGI animated television series. And this new show is pretty cool. It's a lot darker from the other Transformers shows, with characters that actually get killed off and robot corpses that are reanimated as zombies. The character designs are all well done, having most of the robots look cool in both robot and vehicle mode (unlike most of the Michael Bay movie versions that I really don't care for). The only ones I'm not really a fan of is Megatron, who transforms into some Cybertronian Jet, and the generic purple Decepticon cars. The CGI artwork is also really well done here, with a good amount of detail added to both the characters and the backgrounds. Obviously it's not going to be movie quality, but for a TV series it's excellent, I'd say on par with the Star Wars: The Clone Wars series. There are some great dust and smoke clouds especially during explosions, and a lot of the robots skins have reflective surfaces which just looks fantastic as they move. But that doesn't mean they all look pristine, they also have scratches and scraps and dirt scattered around just like you'd expect from the real world. The story starts up with the Autobots on patrol, though not really expecting anything as apparently there has been no Decepticon activity in years. But then Cliffjumper picks up a signal and ends up in a heap of trouble surrounded by Decepticons. The rest of the team scrambles to help, but they're too late. The next time the Autobots encounter Decepticons, a couple of human kids are inadvertently drawn into the conflict, so now the Autobots have to protect these kids, 16 year old Jack Darby and and 12 year old Raf Esquivel because the Decepticons think they are somehow involved with the Autobots. A little later on a third kid, 15 year old Miko Nakadai, is added to the Autobot family and those three along with Special Agent William Fowler make up the human component of the series. 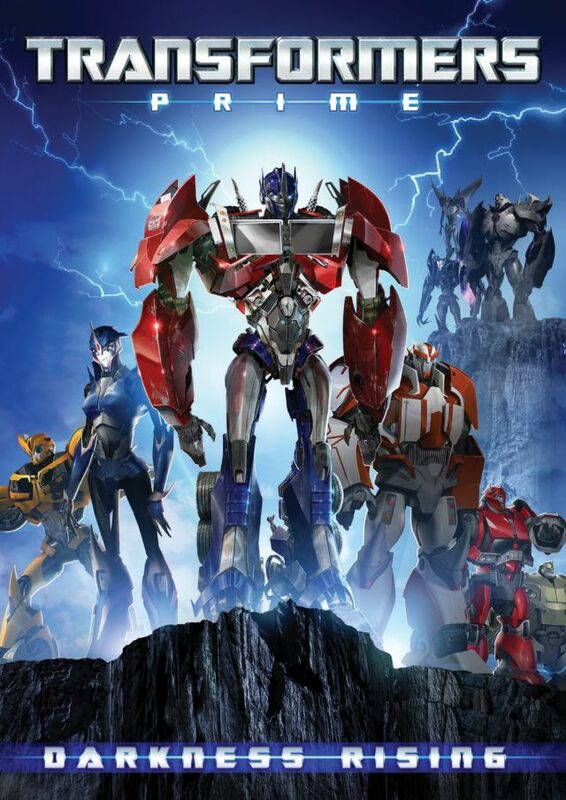 The main Autobots in this series consist of Optimus Prime, Arcee, Bumblebee, Ratchet, Bulkhead, and Cliffjumpter, and the main Decepticons are Megatron, Starscream, Soundwave, Laserbeak, and then the purple generic drones. So initally Megatron is assumed dead and Starscream is in charge, but as we all know you can't have a Transformers series without Megatron so yeah he comes back and is way more fierce than he was in the original series. But the original voice actor Frank Welker still does the voice, which is cool. Optimus Prime also has his original voice actor, Peter Cullen. How could they not use him, his voice is just so cool. I thought those first two were going to be featurettes with the makers of the show telling us how they came up with the character designs and the locations, but unfortunately it's just concept art and CGI models being displayed at various angles. So that was a little disappointing. Still, it's a good DVD and I'd have to recommend it, definitely for renting, maybe for buying, and I only say that because I'm not sure how they're going to release the rest of the season. If they release a box set with the entire season including these episodes then I'd wait for that release. But if that's not going to happen, then yeah I'd say pick this one up.